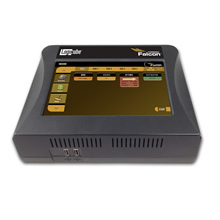 Extremely Fast ImagingThe Falcon is the fastest forensic imaging solution available, achieving speeds of over 30GB/min*. Multiple Image FormatsThe Falcon images and verifies to the following formats: native or mirror copy, dd image, e01, ex01 (e01 and ex01 with compression) and file-based copy. The Falcon supports SHA1, SHA256 or MD5 and dual-hash (MD5+SHA-1) authentication. Multi-taskImprove efficiency and shorten the evidence collection process with the ability to wipe one destination drive while imaging to another simultaneously,or image from multiple source drives to multiple destinations. Perform up to five tasks concurrently. Parallel ImagingSimultaneously perform multiple imaging tasks from the same source drive to multiple destinations using different imaging formats. For example, clone to a network location or a destination drive in native copy format while imaging to a different destination drive using e01 format. Web Browser/Remote OperationAn easy to use and intuitive interface allows you to connect to the Falcon from a web browser and manage all operations remotely. The browser features automatic page scaling for iPad type devices. Broad Interface SupportBuilt-in support for SAS/SATA/USB/Firewire storage devices. Supports 1.8″/2.5″/3.5″ IDE and 1.8″ IDE ZIF and microSATA interfaces with adapters included with Falcon. Optional adapters are available for eSATA, mSATA and flash drives. 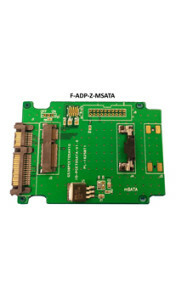 PCIe Support Support for M.2 PCIe and M.2 NVMe type SSDs and mini-PCIe and PCIe express cards is provided using an optional express card adapter combined with specific interface adapters. The express card adapter is connected to the Falcon’s PCIe slot on the rear of the unit. CD/DVD/Blu-ray Imaging The Falcon can image CD/DVD/Blu-ray media by using a USB optical drive connected to the USB port on the Falcon. The Falcon supports multi-session CD/DVDs. WipeWipe up to DoD specifications or use Secure Erase to erase drives, wipe at speeds up to 27GB/minImage to External Storage DeviceThe Falcon allows you to image to an external storage device such as a NAS, using the Gigabit Ethernet port, USB 3.0 or via the SAS/SATA connection. SCSI Module Option The SCSI Module Option expands the capability of the Forensic Falcon by providing support for imaging from and to SCSI hard drives. The Module connects seamlessly to the Falcon and provides 1 write-protected SCSI source port and 1 SCSI destination port. All Falcon features are supported with this module. Image From Desktop/Laptop PCs Users have the ability to image from a desktop or laptop computer without removing the hard drive from the computer. Create a forensic bootable USB flash drive using software (available for download from our website) that allows the user to image a source drive from a computer on the same network without booting the native Operating System on the computer. It also allows drives connected to the networked computer (or directly connected to each other using a network cable) to appear as a destination drive without removing the drive from the computer. For instructions on how to create the USB flash drive click on this link:Forensic Falcon USB Boot Client ver.2.0 Application NoteImage From a MAC™ Image from a MAC™ system booted in “target disk mode” using the write-blocked FireWire port on Falcon. The MAC’s internal drive is seen as a “source” drive. MACs with either FireWire or Thunderbolt ports can be connected to the Falcon, a Thunderbolt to FireWire adapter is required. Read the application note here:MAC As A Source Drive Application Note Error Granularity SettingDrive error handling is enhanced with a configurable error granularity feature. When a bad sector on the source drive is found Falcon will, by default skip that sector. Changing the granularity allows more sectors to be skipped. There are 3 options ( 512 Bytes, 4096 Bytes, 64 KIB,). As an example, if 4096 Bytes is chosen, and one of the 8 sectors in that cluster size contains a bad sector, the Falcon will skip the entire cluster (or 4096 bytes or 8 sectors).Removable Storage DriveO/S and audit trail/logs are stored on an internal drive. This drive is easily removed for secure/classified locations7″ Touch ScreenUses a capacitive touch screen with an easy-to-use interface that provides easy navigation through all operations. An on-screen keyboard is also included. HPA And DCO CaptureDetect and capture Host Protected Areas (HPA) and Device Configuration Overlay (DCO) hidden areas on the source (suspect) drive. Targeted Imaging feature Shortens acquisition time. Create a logical image by using pre-set filters, custom filters, file signature filters, and/or keyword search function to select and acquire only the specific files you need. An MFT report can be generated that contains a potential deleted file list. Format output to LX01, ZIP or directory tree. Users can browse and view directly on the Falcon display or manage and view on a networked Falcon from your laptop/desktop using a web browser. Image to or from a Network LocationUse the Falcon to image to a network location using CIFS protocol and/or image from a network location using iSCSI. The Falcon uses CIFS protocol to provide file system access and the highest level of security and control. Users can also use iSCSI as a source or destination drive. Network Push FeaturePush evidence files from destination drives connected to the Falcon or from a Falcon repository to a network location. The Push feature provides a more secure method than simply copying and pasting to the analysis computer by performing an MD5 or SHA hash during the push process. Additionally, users can select to verify the file transfer to ensure data integrity. Network users can then quickly preview data or copy data to a local drive or to any other directory on the network. The Falcon generates a log file for each push process. Concurrent Image+VerifyImaging and verifying concurrently takes advantage of destination hard drives that may be faster than the source hard drive. Duration of total image process time may be reduced by up to half. User Profiles/ConfigurationsAdministrators can save configuration settings and set password-protected user profiles. EncryptionSecure sensitive evidence data with whole drive AES 256 bit encryption. Decryption can be performed using the Falcon or by using a free open source decryption software such as VeraCrypt, TrueCrypt http://www.truecrypt.org. or FreeOTFE (On The Fly Encryption), http://sourceforge.net/projects/freeotfe.mirror/. Tasks MacroAllows users to set specific tasks to be performed sequentially. For example, first wipe, then image, then verify a drive.Set up to five Macros with up to 9 operations/tasks for each macro. 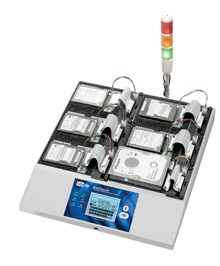 Drive SpanningCapture from one large capacity drive to two smaller capacity drives. HDMI Port An HDMI port is located on the back of the Falcon. This port can be used to connect the Falcon to a projector. One-year Standard WarrantyThe system comes complete with a one year parts and labor warranty. Both an optional 1 year extended warranty ( total of 2 years) and a 2 year extended warranty (total of 3 years) are available. *The Forensic Falcon achieves speeds of over 30GB/min using solid state “suspect” drives that contain a freshly installed Windows “X” OS and random data. Settings used are e01/ex01 image format, with compression and with verify “on”. The specification and condition of the suspect hard drives as well as the mode, image format and settings used during the imaging process may affect the achieved speeds. I had a chance to operate the OmniSCSI unit this weekend. I had to clone a 73GB server boot HD and was able to do that in 45 minutes. This unit is far, far superior ( not even in the same league) with the competition.